Hollie was once K10’s most valued apprentice, now Laing O’Rourke have the pleasure of having her part of their team. Read her story below. I originally applied for an apprenticeship in Painting & Decorating, for which I was placed with a subcontractor on the Francis Crick Institute site, a Laing O’Rourke project close to where I live. I spent a few days with the Senior Site Manager, to get to know the site and broaden my understanding of construction and quickly realised that I was more suited to an apprenticeship in management, so I switched my course to ‘Team Leading’ and continued training under the site management team. I enjoyed it so much that I was eventually given the opportunity to officially join the Laing O’Rourke team, on the condition that I proved my determination and ambition by completing my apprenticeship with K10 first. 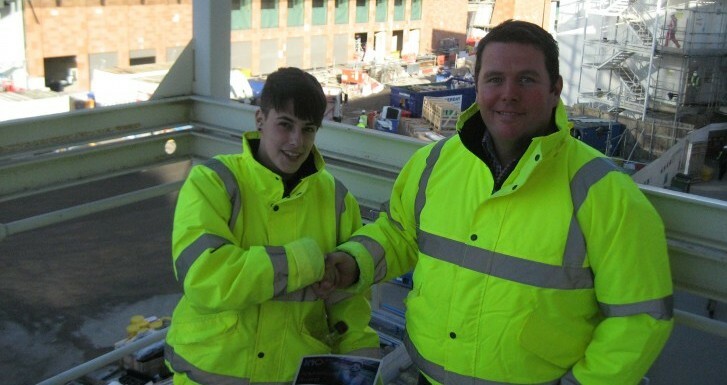 This was easy however as I enjoyed coming to site so much – the work was varied, challenging and, what’s more, I had all the right support around me: from the site manager, the wider site team, the LOR apprenticeship advisor, and K10. I successfully completed my apprenticeship and subsequently won an award for ‘Most Valuable Player’ with K10 and went on to join the Laing O’Rourke team as a ‘sponsored learner’. I am now working at the Clarges site in Mayfair with the Health & Safety and Quality team whilst studying one day a week for an HNC in Construction Management at Southbank University. This will lead to an undergraduate degree course later this year, with the opportunity eventually to gain an official Chartership with CIOB afterwards. The sense of satisfaction and accomplishment that I felt for being part of the team on the Francis Crick project has given me the drive to aim higher and progress within the industry. After I have gained my qualifications I would like to continue my personal and professional development through Laing O’Rourke, and in ten years time I hope to be in a leadership position. I couldn’t have even come this far, however, without the support of the many people in Laing O’Rourke who firstly gave me the opportunity to gain my initial experience, and are now supporting my continuous development within the industry.